This page describes some practical information on how to use air regenerated acid cupric chloride to etch printed circuit boards at home. The information in this guide is based on my discoveries using and exploring cupric chloride etchants at home. While investigating air regenerated cupric chloride as circuit board etchant, I felt there was general lack of detailed information available, especially in hobbyists circumstances. Having since learned much more about this etchant including practical methods, I was inspired to write this guide to share what I have learned, and hopefully help other hobbyists who want to understand more about using cupric chloride at home. Of the several types of etchant chemistries the hobbyist can choose, acid cupric chloride (also called acid copper(II) chloride or just cupric chloride) is one of the more interesting types, since it has the ability to be regenerated, or replenished, without having to throw away the solution. This is the reason why cupric chloride is one of two main etchants widely used by PCB fabricators. The primary advantages of cupric chloride in a hobbyist prospective is that a maintained solution never becomes exhausted. The disadvantage is the extra work is required for occasional bath maintenance. People who sparingly etch circuit boards, will only want a temporary and low complexity etch method. For simplicity, you cannot get any easier than pouring some ferric chloride or ammonium persulfate in a plastic container, heat it a little in the microwave oven, and immerse the PCB. More serious people may go to the effort of setting up a vertical bubble etching tank. It is these people who may find it beneficial to own an etch tank that does not deplete or decline in etching speed. Figure 1 shows graph of relative etch rates vs temperature for three different etchant chemistries, all solutions were freshly prepared. Ferric chloride: specific gravity =1.47. Cupric chloride: HCl concentration=2.7M, specific gravity=1.27, cuprous ion < 2g/L. Ammonium persulfate: concentration=200g/L. Etch rates were determined with my copper etch rate apparatus and vigorous air bubbling was used for solution agitation. The aim of these measurements were to find if unheated solutions give acceptable etch rates. The ammonium persulfate is obviously not suitable for room temperature operation. However the ferric chloride and cupric chloride still may be useful down to zero degrees. Temperatures > 42°C were not tested since both ferric chloride and cupric chloride would create too much fuming for a practical hobby etch tank. Added note: The persulfate test showed considerably reduced etch rate compared to ferric chloride or cupric chloride. According to experience with conventional bubble etching, the 50°C persulfate solutions are only marginally slower than ferric chloride. A possible theory why my tests showed only 1/4 etch rate of ferric chloride at 42°C, is that vigorous solution agitation has a greater accelerated effect on ferric chloride or cupric chlorides than it does on persulfates. This agitation acceleration could explained by the insoluble copper(I) film formed with ferric chloride or cupric chloride as being the limiting factor on etch rate. Persulfate on the other hand do not form insoluble surface films, and so etch rate is limited only by solution kinetics. When agitation is strong then the film is removed quicker allowing a rapid increase in etch rate of ferric chloride or cupric chloride solutions, while in persulfates, etching it still limited by rate of fresh persulfate ions encounter the copper surface. The Cu1+ ion is not soluble in water but it can be made soluble with the help of coordination ions which are ions that surround the Cu1+ atom by electrostatic attraction. The chloride ion, Cl -, is one such coordination ion for Cu1+. If one prepares a solution containing Cu2+ and Cl - , for example by dissolving cupric chloride in water, then that solution should have the ability to etch copper metal because the Cu1+ ions are soluble in such a solution, and reaction  can proceed. In reality, the Cu1+ ions need a relatively large concentration of Cl - in order for them to be soluble in water. In practice, the concentrations of Cu2+, Cu1+, and free acid, affect the etching speed. In particular the Cu1+ ion has a large affect on etch rate. Cu1+ has much lower solubility compared to Cu2+ and because it is generated directly at the surface of the copper, where the reaction is taking place, its presents will inhibit etching. The Cu1+ ions therefore must be removed away quickly as possible from the copper surface in order to maximize etch speed. One way of achieving this is to maximize the solubility of Cu1+so it can quickly diffuse into the bulk solution. Diffusion of Cu1+ from the copper surface is increased by keeping concentrations in the bulk solution to a minimum. Operating air regenerated cupric chloride etchant requires more attention to operating parameters than it would to commonly used hobby etchants, for example, ferric chloride or ammonium persulfate. Etch speed will be impaired if bath parameters operate too far out of range. When etching is too slow then the benefits of using cupric chloride may be lost. As the main objective of this guide is to demonstrate how to properly use air regenerated cupric chloride, I present here the results from a series experiments I had done which demonstrate the effects of etch rate under various operating conditions. It turns out the major variables affecting etch rate are temperature, Cu1+ concentration, and free acid concentration. For a detail description of the experimental method, see my copper etch rate apparatus. Below is a discussion of my results and a summary giving recommended operating parameters. Figure 2 Shows that etch rate is strongly affected by acid concentration. The relationship is fairly proportional, and the plot shows no etch time minima. The problem operating at very high acid concentrations is excessive fuming from open tank bubbling etching solutions. Therefore the maximum limit to acid concentration depends on the level of fuming tolerated. Higher temperatures also contribute to HCl fumes. As a rough guide I would not recommend HCl above 4M in enclosed spaces at temperatures above 25°C. The smell and corrosive nature of HCl from such solutions may cause other problems. I found that at acid concentrations of about 2.5~3M, and at temperature 30°C are about my preferred limit for an open top air bubbling tank. Concentrations under 1M are very low fuming, but etch speed will be compromised. The graph of figure 1 may help you choose acid concentration based on relative etching time. Figure 3 shows that etching time is only effected when specific gravity becomes extremely high or extremely low. The specific gravity is mostly dependent on copper concentration , and partly dependent on acid concentration. The flat plateau in the graph occurs when specific gravity in the range of about 1.200 to 1.400. This corresponds to a vary large variation in copper concentrations (sorry I don't have numbers). I would not recommend operating at 1.200 or at 1.400, as these values are getting too close to the plateau ends. According to a cupric chloride technical document from Chemcut corporation , they recommend optimum specific gravity to be between 1.240 to 1.330. This range lies about directly in the middle of figure 2. For the hobbyist a safe range for specific gravity may be between 1.22 and 1.38. This may sound like a small numerical difference, but the physical change in copper concentration is quite large. Figure 4 shows etch rates, where each solution contains a different initial concentration of Cu1+. It is well known that etch rate of cupric chloride are strongly affected by relatively small concentrations of Cu1+, see CuCl chemistry. It is therefore expected that etch rate will decrease as more copper is dissolved when in a limited volume of solution. The graph demonstrates that when more than approximately 5 g/l of copper is dissolved in solution and is not regenerated (i.e the formed Cu1+ is not oxidize to Cu2+) then the etch rate begins to decrease, and becomes almost zero when monovalent copper reaches above 20g/l, which is almost at saturation. It also predicts the minimum volume of solution necessary to dissolve a given mass of copper without sacrificing etch speed. For typical double sided PCB with 36μm thick foil thickness and 50% pattern coverage, then a safe estimate of minimum volume of etchant per unit board area calculates out to be 1.6 liters/dm2 (16 ml/cm2). However air is normally bubbled through the solution during etching, and so the solution will be in the process of regenerating during this time. Because of this, minimum volume will be actually be less than predicted and depends directly on the efficiency of the air regeneration system. In other words, this 1.6 liters/dm2 value should be treated as being very conservative. Table 1. Recommended bath operating parameters. sided, 36 μm ("1oz") copper PCB. brown color indicates too high Cu1+. The temperature and acid molarity both contribute to HCl fuming. When temperature is at the high end of the range then acid molarity should be reduced, and when temperature is low end then acid molarity can be increased. These two parameters are best determined through personal experience in your environment. The high copper content in cupric chloride etchants give them a high density. Specific gravity measurement then becomes a reliable (and simple) method of estimating copper. The easiest way to measure density is with a glass hydrometer. If you use a vertical etching tank that is > 200mm deep then a typically glass hydrometer could be immersed directly in the tank. The other way is to use automotive lead acid battery hydrometer, although the highest reading of these devices is usually 1.300. First step is to prepare the titrant, which will be a 1.0 Molar sodium hydroxide solution. This solution can be made by dissolving 40 ±4 grams of sodium hydroxide per liter of water (any water thats drinkable will be pure enough). The sodium hydroxide I've seen at supermarkets is normally %99 and comes as tiny grains that should be free flowing. If you don't have access to a set of scales with 1 gram resolution then it is possible to obtain a known mass by measuring volume of the dried sodium hydroxide grains. I measured density of these grains to be about 1.13 g/cm3. For example, you can use a 20 ml kitchen measuring spoon to get ~22.6 grams of NaOH and dissolve this in 550 ml of water using a kitchen measuring jug to get approximately 1.0 Molar solution. Another possibility to obtain 40g of NaOH is to take a sample to your local post office and ask them to weigh it for you. Store the titrant in a clearly labeled plastic bottle. Preparing this is a once off procedure. Fill the glass bottle with approximately 10 ~ 30 ml of warm water. Using the graduated syringe, add 1.0 ml of the etchant solution which is to be tested (the analyte). To avoid corrosion of the stainless steel needle flush the syringe immediately with the diluted solution in the bottle. Now, take up 1.0 ml of sodium hydroxide titrant into the syringe, and then immerse the needle in to the solution. Slowly add the titrant by pressing the plunger down while at the same time move the syringe around in circles to keep the solution stirred. You should see localized copper hydroxide formed next to where the sodium hydroxide contacts the diluted etchant solution. Before the end point has been reached, the copper hydroxide formed will redissolve in the unreacted acid upon stirring. The end point is indicated when solution first begins to loose clarity throughout. See the titration photographs to get a better idea of what I'm talking about. Hold the solution up to a bright light or torch to help observe the turbidity. While approaching towards the end point the copper hydroxide increasingly takes longer to re-dissolve in the unreacted acid because there is less free acid available. Higher temperatures will speed up the reaction and is why hot water was suggested to initially to fill the bottle. Once the end point has been reached then make note of the total volume in cm3 of titrant that was added. This number will equal the free acid molarity (moles per liter) of the etchant. The appearance of the solution is probably the best way of determining if Cu1+ concentrations is too high. 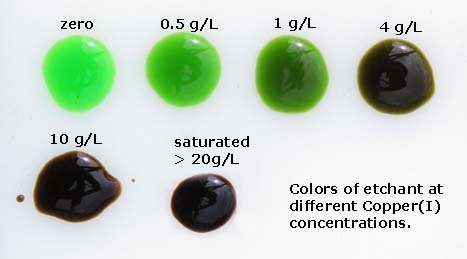 Figure 5 shows color comparisons at various concentrations of dissolved Cu1+ ions. You can clearly see that Cu1+ in solution makes it extremely dark, and even small concentration in the 1 g/Liter range will make the solutions darker and more diffuse than normal. When Cu1+ is completely removed or exists only in trace amounts then the etching solution is a deep green transparent color due to Cu2+. The concentration of Cu2+ is normally so high that you cannot see through more than about 10 mm of solution depth under normal light. Therefore to check if Cu1+ concentration is acceptable, you can look at drops of solution sitting on a white surface. On a side note, when the etchant solution is sufficiently diluted then Cu1+ precipitates out as cuprous chloride (a white solid). Visible signs of the white precipitate however only show up when concentrations are very high, or too high for reasonable etching performance. Figure 5. Photo of different etchant solutions on a white surface. Each color shows different concentrations of dissolved Cu1+ ions. Three bath parameters need controlling: Acid concentration, specific gravity and Cu1+concentration. I recommend bath adjustments be made in that order because some adjustments made to one parameter will also affect another. Its always a good practice to remeasure the bath after you've made modifications. If acid is too high, and the specific gravity is already low, then water should not be added to the etchant in attempt to reduce acid concentration. The specific gravity may drop too low. In this case there no way of reducing acid except by allowing the HCl gases to evaporate or get consumed during normal etching. In other words don't worry about high acids. To increase specific gravity the solution must be evaporated. To decrease specific gravity water must be added. To decrease Cu1+ concentration the bath must be aerated. See chemical equation . If you want to be pedantic then the solution can be aerated after each etching job until the color is a completely transparent bright green, i.e. Cu1+ concentration << 1 g/L. There is multiple ways one can prepare a solution of cupric chloride and hydrochloric acid. The table below is list of the two different methods which are described in in detail below. All the preparation procedures described here will require an empty fully functioning etching tank fitted with an air bubbler. The solutions will actually be prepared in the etch tank. If you are hard up for cash, you can make copper chloride etchant from just scrap copper metal and hydrochloric acid. This method prepares etchant by dissolving copper in a solution containing a high concentration of acid and a small concentration of oxidizing agent. The reason for the oxidizing agent is that copper metal will not otherwise react with hydrochloric acid. Two usable oxidizing agents are hydrogen peroxide and Cu2+ ions (as cupric chloride). When Cu2+is the used as the oxidizing agent then it brings up an interesting situation. Provided free acid and oxygen are supplied then the reaction of copper will be self perpetuating since the reaction product, Cu2+, is also the reagent (the oxidizing agent). To solve the dilemma of using Cu2+ as the oxidizing agent we have to somehow initially added some to the solution for the reaction to start. It is possible to create a small amount of Cu2+from copper metal without needing any Cu2+. When copper is wetted with hydrochloric acid and exposed to air and fumes over a long period of time, it corrodes to form a mixture of hydroxides and chlorides coating the exposed surface. See picture of copper oxides. This reaction with air is slow, and the process can add several days just to get enough oxides of copper to start the reaction. Once some copper is dissolved (oxidized), the reaction accelerates as more cupric ions build in the solution. Alternatively you can use hydrogen peroxide and avoid having to have any Cu2+to initiate the reaction. The overall length of time it takes to prepare etchant using his method makes it a good time to do when you are busy doing other thing in your life. Fortunately your attendance is only required once a day or less. The procedure outlined below should make a solution having specific gravity of approximately 1.24 to1.26 and a free acid concentration approximately 2.5M..
VT = final volume of etchant solution in liters. Begin by weighing out 120*VT grams of copper metal and place into the tank. To help speed up the process, the copper metal should be finely divided so that surface area/mass ratio is maximized. An ideal source of copper is that of scrap multi stranded electrical power cables. I found that 1 mm diameter stranded copper wire formed into a loosely bundled mass worked well. Ultimately the limit of reactivity becomes how fast oxygen can be dissolved in solution. Add 0.10×VT liters of concentrated hydrochloric acid ( > 25% weight) to the tank. There should only enough hydrochloric acid so that about 1/8 ~ 1/2 of the of the copper is immersed. That way the fumes from the acid will react with air exposed parts of the copper and form crusts of copper oxides. I'd found best results when using concentrated acid, even though most the HCl gas probably escapes in the air, it the fastest approach to get things started. Leave to stand for about 3 days or more (no limit) with the tank top open to allow oxygen from the air + HCl fumes to react with the copper. After this period the solution should be a dark brown opaque color. If the solution does not have this characteristic then it needs further time. The parts of copper immersed in the acid may have visible signs of etching while most of the copper above the acid level should be coated in a crust of blue/green copper oxides. See picture of corroded copper metal in a tank. Add 0.60×VT liters of concentrated hydrochloric acid and 0.30×VT liters of water. Turn on the air bubbler, and leave it going until the solution becomes transparent deep green indicating the complete oxidation of all copper atoms into Cu2+. The copper metal will slowly dissolve as air oxidizes the Cu1+ according to reaction . The process can take anywhere from one day to over a week depending on how efficient the aeration is setup. An efficient aeration system will cause the solution to rise 5~10°C due to the exothermic reactions taking place. Acid will continuously be consumed by the reaction and so it can be a good idea keep it in check. Provided acid is above 0.5M then the oxidation reaction should not be restricted. If acid drops to zero then the reaction will completely stop. There will be a point towards the end where all the copper metal has dissolved, while the solution still containing large amounts of Cu1+, as evident by the opaque dark brown color. Finally measure the free acid, and if needed add appropriate amount of acid. Add water to bring at final solution volume,VT, if needed.. It is very quick to make a etching solution from salts of copper (copper(II) oxide or copper hydroxide) provided you have these salts at hand. This method involves measuring out the calculated quantities of dried salt, concentrated hydrochloric acid and mixing them all in the etching tank. For measurements, the use of kitchen weight scales, and kitchen plastic measuring items are sufficiently accurate (+-10%). The quantities of concentrated hydrochloride acid, copper salt (copper hydroxide or copper(II) oxide) are determined by the following equations which are based on a recommended dissolved copper content of 120 g/L . Make to final volume with water. Always perform acid analysis after solution make up to confirm correct acid concentration. Table 2, Relationship between molarity and % weight of hydrochloric acid. In Australia the EPA regulates maximum copper in sewage discharge to 5 ppm. If you have etchant containing 150g/L of copper, that means a dilution 1:28000 is necessary to meet regulations. This not a practical. If you have a "lot" of solution to dispose of (and I'll let you define how much is a "lot") then dumping would not be fair on the sewage treatment facilities or our environment. There many ways of converting copper solutions into a solid (or insoluble) form that you can dump and hopefully not leach back into ground waters. In alkaline environment copper ions precipitates out of solution as copper hydroxide (or sometimes as black copper(II) oxide under very strong or hot alkaline conditions). The standard method of precipitating many dissolved metals in industrial waste waters, is to put the waste liquid in a large vessel, and neutralize to pH above 9, by addition of sodium hydroxide, sodium carbonate, or lime. The solution is left to stand for 24 hours or until all the hydroxides settle. The problem with copper hydroxide is it does not compact very well in solution and separation of solids only works well with small copper concentrations < 1 g/L For a description of hydroxide precipitation see Treating Plating Wastewater article on the pfonline website. I found this to be the only practical method of precipitating cupric chloride etchants for disposal. This method involves adding lime (calcium hydroxide) directly to the cupric chloride etching solution. The copper is converted to hydroxide, just as it would be if sodium hydroxide was added, however the reaction with calcium is much less violent, and the sludge formed is a lot less liquid. When the lime is initially added the acid will first neutralize, followed by the formation of copper hydroxide sludge. As more lime is being added the color of the sludge will start out green because cupric chloride has been made insoluble (not enough water), and eventually becoming a consistent blue color once all copper is takes the form of copper hydroxide. At this point you can either make cement out of it or dry it and put it to land fill in a sealed container. HYDROCHLORIC ACID, is one of the most widely available strong mineral acid around. It is often used as brick cleaner to dissolve cement, or as a pH adjuster for home pools. Many hardware stores and building supplies will sell hydrochloric acid. HCl is usually sold in concentrated form. I've seen it sold anywhere from 26% to 33% by weight, and the labeled concentrations were shown to be surprising accurate. SODIUM HYDROXIDE is available in pure form most supermarkets < 1kg. Common synonyms are caustic soda, soda lye, lye. I've tested various brands and were shown to be > 99.0%, given the limitation of my measurement accuracy. The powder should be dry and free flowing. NaOH is very hygroscopic so minimize time with lid off. COPPER metal is best obtained from scrap metal recyclers. Copper is one of the easiest metals to recycle and all the scrap metal recyclers I've ever visited had piles of scrap electrical power cables. COPPER(II) OXIDE, is often used as a black pigment for paint manufacture. I have never shopped around for copper(II) oxide, so I don't know if there exists a cheap source of a few kilograms. I'd imagine expensive sources would be laboratory supplys, and art supplys who sell pottery glazing pigments. COPPER HYDROXIDE, is available at some gardening stores sold as a fungicide. If you plan to make 10+ liters of etchant, it may be an expensive source of copper salts. LIME, available from gardening stores, and from building suppliers. HYDROMETER, laboratory supplies would be my first choice for a hydrometer.Some home brew wine suppliers sell hydrometers too. An ideal range would be 1.200 to 1.400. Hydrometers are priced according to accuracy, so anything with specific gravity accuracy of ±0.025 or better will be ok. A hydrometer used for measuring automotive lead acid batteries will be suitable for cupric chloride etchants, except maximum reading will usually be limited to 1.300. 1.0ml GRADUATED SYRINGE, are available from just about any pharmacy. The 1 ml disposable syringes are often used for delivering insulin. Copyright© 2005 Adam Seychell. All rights reserved.